book review – Page 2 – Brendan Mancilla, Author. It’s safe to say that I’m extremely late in jumping on this bandwagon. When The Hunger Games splashed onto the scene a few months ago, I was largely indifferent to the stirring of pop culture’s newest poster child. Having finished the novel after little more than three days of sparse reading, I feel that I have a well-defined idea of what the novel accomplishes, where it falls short, and some of the motivation behind the mania. I address this portion of review to the few, if any, remaining readers who have yet hunker down with The Hunger Games. Narrated by Katniss Everdeen, a young woman who volunteers to replace her sister in the gladiatorial competition that is the book’s namesake, the story is told in the present-tense through a first-person point of view. Set in something of a post-apocalyptic North America that has reorganized itself into 13 districts set around an elite Capitol, the competition is a yearly reminder of the failed rebellion against the Capital some 74 years past. This is the first hint at the compelling backstory behind the book: the shared history and misery of the twelve remaining districts. Everyone lives in near squalor and poverty in District 12, from which Katniss and the baker’s son Peeta are selected to represent. Collins offers up a hodgepodge of supporting characters upon the departure from District 12. She depicts the drudgery of life in a district in sharp contrast to life in the richly colored society of the Capitol. Really, the two most compelling characters are Katniss and Peeta because the novel comes to life as they struggle with their feelings towards each other. These two characters, bound by the common cause of survival, nevertheless operate on two completely different frequencies throughout most of the novel. Frankly, it’s fascinating and engrossing to be inside of Katniss’ head and realize that she is simultaneously the smartest and most oblivious person in the games. Otherwise, I’m not a huge fan of the first-person perspective because I find it jarring and overly-pandering. Too much telling and not enough showing. There’s a lot of that here in The Hunger Games since Katniss often recites the history of Panem, using her own knowledge to fuel exposition. Collins shines at the memories that Katniss retells to the readers, therein pulling off stunning character development. 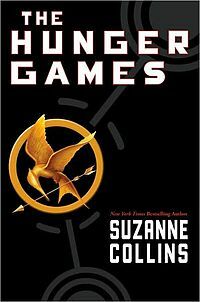 The Hunger Games is an inventive novel that is both exciting and thoughtful. Collins uses the Gamemakers, who are the ambiguous designers behind the atrocities in the arena, to create an amorphous environment that challenges the combatants. She touches on everything from class divides, to mortality, and family. And she does it so well within the confines of a young adult novel she deserves every ounce of credit she’s getting. But if I had to pick a reason that The Hunger Games resonated with me, I can sum it up in two words: Katniss Everdeen. In a world where the likes of Twilight, the Jersey Shore, and that endless string of Nicholas Sparks novels-turned-movies are reducing women to gender caricatures (dainty, indecisive, always on the prowl for sparkly boyfriends); Katniss Everdeen is a break from the mold that audiences desperately needed. She’s a no-nonsense warrior who’s a master at her craft, dedicated to her family, and unwilling to needlessly sacrifice her humanity. As an older brother of no less than three sisters, I’d rather have my sisters addicted to the adventures of Katniss than Bella. Is Katniss the perfect hero? No. Does Collins still play up the angst and drama to string us along? Yes. Do we finish The Hunger Games feeling less certain about our understanding of her than ever before? Of course, this is obviously book one in a trilogy. What it boils down to is that Katniss is a character I can respect, perhaps the most respectable feminine character in current pop-culture circulation. That, my friends, is what makes The Hunger Games and Suzanne Collins worthy of such outstanding media notice. Is The Hunger Games a triumph of English literature? No, not by a long shot. But it is a captivating story with a relatable protagonist that is set in a world that’s not altogether unlikely (if you’re judging by present standards). I found the blood and gore sufficient for the novel, but if it left you feeling undercut then you might want to check out Battle Royale, the Japanese movie of which The Hunger Games feels like something of a spiritual, if American, successor. My final word on the novel is that, without a doubt, it is worth the read if you can spare the time. If you can’t, I don’t imagine that you’re missing a huge literary movement, but you are missing out on the most exciting phenomenon since Harry Potter. I applaud Suzanne Collins on an impressive world, a fascinating cast of characters, and pulling off the enormous feat of leaving me only minutes away from stealing my sister’s copy of the sequel, Catching Fire.